Named after a 19th century redoubt (military fortification) that used to stand in the area, the neighbourhood of Reducto is part of Montevideo’s Zone 3. The fortification’s bricks were used in the construction of the neighbourhood’s church, fittingly named the Church of the Redoubt. 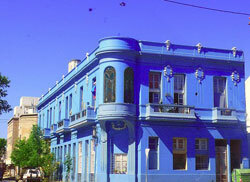 Another landmark here is Plaza Eugenio Garzón, which has a monument in honour of urban workers. Reducto is near the neighborhoods of Jacinta Vera, La Figurita, Villa Muñoz, Aguada, and Capurro Bella Vista.